Our relatively average winter turned into a harsh cold one in late February, holding back a lot of the native plant species. Little bits of cherry plum blossom started to come out, then stopped, and there weren’t many native daffodils out for St David’s Day. I hope we are lucky through the start of spring and don’t get another cold blast. Cold in February doesn’t do too much harm – cold in April does! Ash is the Celtic tree for this time of year. It gives its name to a letter of the alphabet that was still used in Old English for the short “a” sound. It’s generally represented nowadays by Æ and you can see it in the name of the founder of Alvechurch and our women’s Morris side, Ælfgythe. So, ash is our tree too. Ash was also in Norse mythology the tree of life, called Yggdrasil. This was the source of all life and its branches covered the world. In Greek mythology the gods met under a great ash tree, which had an eagle on top and a snake coiled round the bottom. There are links there with the tree of knowledge in the Christian garden of Eden, though that was not an ash as our ancestors ate the fruit! Even in relatively recent times ash was though to have healing powers. 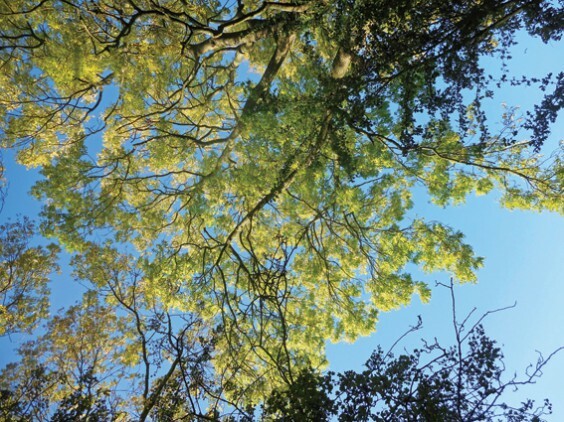 There are stories of sick children being passed through a cleft in an ash tree to heal them. Perhaps one of reasons for its powerful associations is that it grows fast, but can also grow to a great height and girth and live to an old age. Very few trees do both! Ash was perhaps the most prized of all trees for the variety of uses and adaptability of its wood. The common name for a walking stick was an ashplant, as it was the most common wood used for this. It was used for houses, furniture, ships, wheels, poles, sporting equipment (oars, hockey sticks, billiard cues) – even the famous fork handles. It is pliant and bendable as well as strong. It also makes great firewood, which can be burnt new as well as seasoned (“Ash green, fit for a Queen”) unlike many hardwoods. The trees were usually coppiced, developing huge bases (“stools”) from which a little forest of branches grew for cutting. This meant the trees seemed to last for ever, perhaps another reason for their link with the gods. Coppicing was really important in the rural economy, creating a sustainable supply of wood for manufacture and fuel. Trees are cut down to a base, which then sprouts lots of branches. After a few years these are harvested for use and the process begins again. Not all trees coppice well, but ash does and so does hazel, which I will write about in the summer. There are still woodsmen carrying out coppicing, including one in Alvechurch who coppices hazel for beanpoles and other plant supports, not to mention Morrismen’s sticks! Coppicing and other woodland management is not just important for sustainable wood, it is good for all wildlife too. By letting light into woodlands it encourages the growth of flowering plants, and therefore of insects, birds and all the other elements that make up biodiversity. Ash spreads really well, as anyone with a garden near an ash tree will know. It seeds readily and the young whips grow very quickly. I have had to remove some from my garden, where I normally let anything grow that arrives by itself, otherwise I would just have an ash forest! All of this means that ash has a very strange history. It was loved and revered, it was prized by ordinary people for its ready growth and usefulness. But later, it began to be seen as a nuisance, a second-grade tree, almost a weed. It was often removed from woods to let more unusual trees grow. This was very short-sighted. After the mass destruction of woodland in the great storm of 1987 (the one that wasn’t a hurricane!) it was ash that came back and filled the gaps. In more recent years, the picture has got even madder. While people were happily grubbing up native self-sown ash, they were also importing young ash whips from abroad to create new woodlands. There seems to be some sort of prejudice in England against naturally occurring woodland, often dismissed as “scrub”, in favour of planting young trees brought in from elsewhere. The result in this case was the introduction of ash dieback from abroad, a deadly disease for the tree. It has caused loss of trees especially in the east of England, first in young trees then spreading to some established ones. Ash is no longer imported and is not usually planted now. If you look at recently-planted native trees, such as the new ones along the railway in Alvechurch, there is no ash. Tree experts still don’t know how bad the disease will be. However, some are quite hopeful that many of our established trees will turn out to have immunity. If a large number die, it will have an enormous effect on our local ecology. At this time of year, ash is lovely to see. The blunt black buds that have tipped the twigs over winter start to burst into flower – a tassel of purplish-yellow stamens. The leaves come afterwards around the flowers. It is usually the last naïve tree to come into leaf, often not till May. Oak nearly always has leaves before ash. However, oak is more susceptible to temperature whereas ash reacts more to light. So, in a cold year the oak may be later and may come out with or even after the ash – quite likely this year. Like most of these sayings, it’s much more about what has been than what will be! Ash has lovely feathery leaves, pairs of leaflets set along a central stem. It is relatively open in habit, so it lets sunlight through even in summer, and other plants will grow under it. Having been the last leaves to arrive, they are one of the first to drop, turning a beautiful yellow in early autumn and dropping quickly. The fruit is a hard seed with wings, called “keys”, which blow in the wind and help spread the trees. When young, they are edible and were sometimes pickled for later eating. When mature they are hard and brown and often stay on the trees through the winter. Another tree to look out for in April is our native cherry or gean, which doesn’t figure in the Celtic calendar. It is quite common around here and many people don’t realise it’s a wild native. Unlike some of the pink introduced cherries, it has bunches of large pure white flowers in April. It has lovely glossy bark, and long leaves. In the autumn the leaves turn a beautiful red. The fruits are small and red and quite edible, though not as sweet as the darker cultivated cherries. However, they only ripen fully in a good summer, and you have to get them quickly before the blackbirds do! Wild cherries are often included in plantings along newer roads, and I think everyone should have one in their garden: beauty all the year round and perfect for bees and birds. A mixed woodland with feathery ash and shining cherry blossom is one of the delights of April, especially if there are bluebells underneath. Roll on spring! Following my St Patrick’s Day poem last month, here’s one for St George on April 23. Through a spring midland landscape. Bringing life and the clarity of youth back. The banks of primroses and heliotrope. At the pub past the bottom lock, journey’s end. At the heart of England. Happy birthday, Will.